Be honest. Do you still decide which mobile device you want to buy by just watching a TV advertisement? Certainly not. Technology has completely transformed the way we make our buying decisions. And not surprisingly, marketing has changed to adapt to this transformation. 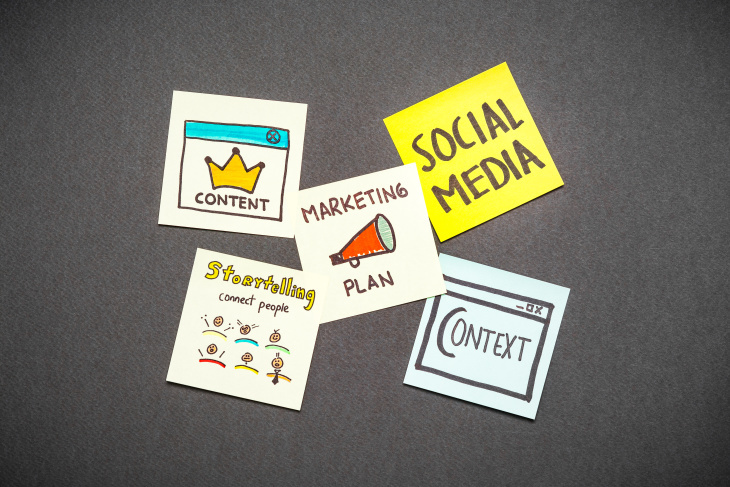 This is the age of inbound marketing. The smart customer of today is internet savvy and likes to make decisions based on their own research. Outbound marketing, on the other hand, is quite in-your-face. More so, it is targeted at one and all, interested as well as the least interested people, making the marketing method less effective. To put it straight, outbound marketing is interruptive. And when it comes to inbound marketing what better medium can there be to help them make an informed decision, but email marketing? The inbound methodology involves four stages: attract, convert, close, and delight. The first stage, attract, is about attracting visitors to your website. This involves SEO and social media marketing, and emails are not involved at this stage. Emails come into play at the next stage. This is the stage at which visitors need to be converted into leads. You got them to your website and the next step is to acquire their email address so you can communicate with them. Share a white paper, e-book, or any content resource that they may be looking for in return for valuable contact information in the form of their email address. This method helps you get just the right email addresses because only those who are actually interested in your products/services will sign up. The visitor is now a lead, a marketing qualified lead (MQL), to be precise. This lead needs to be nurtured and the nurturing can be successfully done through emails. Let us now take a look at the various emails that are sent to the leads at this stage in order to gradually convert them into sales qualified leads (SQL). A welcome email is the first business email you send—make it sound more informal than formal. While you confirm that they have successfully subscribed, you also need to prepare them for the emails you will be sending in the future. And yes, send a welcome email immediately because Soundest states that 74.4 percent of customers eagerly wait for a welcome email after subscribing. Automation of welcome emails will make the task easy for you. Take a look at this email from Topshop which hits the nail on the head. To nurture a lead, first, you need to know the lead well. How is that possible? There are two ways to do that: by asking them questions or collecting some basic information during the sign-up process and through their browsing behavior on your website. 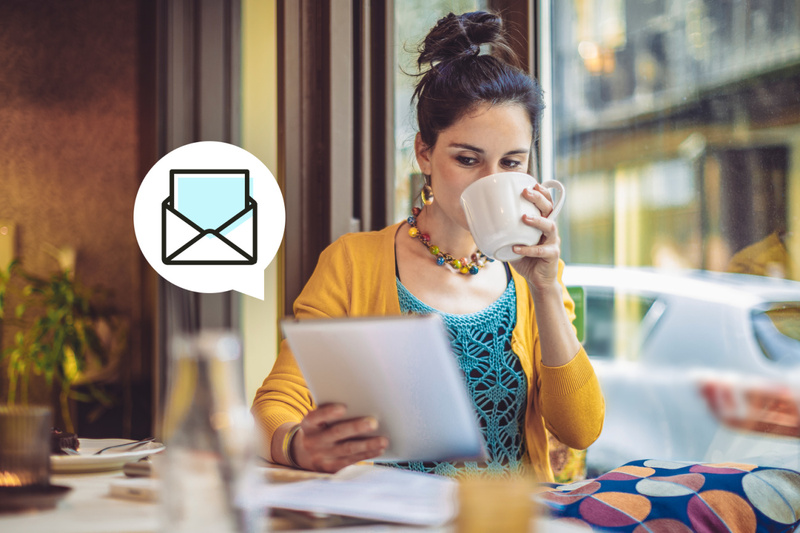 These two methods will help you personalize your emails with dynamic content. With all this information at hand, you can help them by providing solutions to their problems through your products/services. Never ever sound pushy, though. Subtly yet cleverly, you need to make them believe that you are their best option—leading them into the customer journey. These emails from Topshop are great examples of how to create lead nurturing emails with the inbound methodology in mind. Setting an automation for lead nurturing is a great way to save effort. But don’t forget to segment your list in order to send targeted emails - i.e. the right emails to the right people. Lead nurturing will continue through this stage as well. These emails can be automated to lessen the burden on your shoulders. Apart from website behavior monitoring, another tool that can help you at this stage is social media monitoring. Understand your leads better in order to lure them into buying from you. What are they looking for? Are they budget conscious? Or are they the choosy type who needs a lot of convincing? You need to cater to their needs and provide relevant content and offers to persuade them at the right time. This email from Asics is a beautiful example of a cart abandonment email. While they nudge the abandoner, who is for sure interested in their products, to make the purchase, they also suggest other best sellers which might interest them. Transactional emails, which include the order confirmation and order shipment information are also an important part of this stage. Let your subscribers know that you care about their order and what exactly is happening with it. Moreover, transactional emails get 47.1 percent open rates as compared to 21.6 percent for non-transactional (marketing) emails. Make the most of these numbers. Transactional emails, just like the cart abandonment emails, are a great chance for you to cross-sell and upsell other products/services; do it and do it well. Once a customer, always a customer. Good and repeatedly good customer experience plays a vital role in retaining customers and turning them into evangelists. If you are good at providing that, your customers are going to become your brand ambassadors. So, from the very beginning and considering that there is no end, you have to be on your toes, giving each email subscriber just what they are looking for. Make sure you keep in touch with a customer even after they have purchased from you. 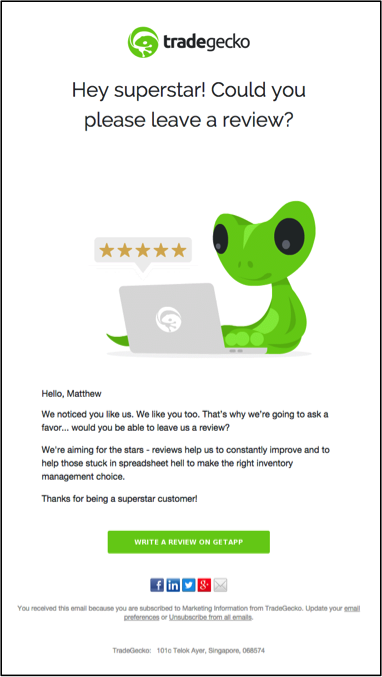 Tradegecko sends its customers an email in order to get a review for their recent purchase. This way, you still keep in touch with the customer as well as collect information that helps you improve your business strategy. The inbound approach helps you to send relevant emails to a targeted audience at the right time. Moreover, it allows you to connect with your subscribers at the personal level, which in turn increases traffic, leads and ultimately sales for your business. Kevin George is the head of marketing at EmailMonks, one of the fastest growing Email design and coding companies specializes in crafting beautiful email templates, PSD to HTML email conversion, and free Master Email Templates. He loves gadgets, bikes, jazz, and breathes email marketing. He is a brand magician who loves to engage and share insights with fellow marketers. Feel free to connect with him on Twitter and LinkedIn.